Thankfully, the myth that lifting anything heavier than your purse will turn you into Mr. Olympia overnight is mostly dying down. On the other hand, with the growing popularity and proliferation of CrossFit gyms, we are seeing a lot more women with low body fat and well-defined, often prominent muscles. 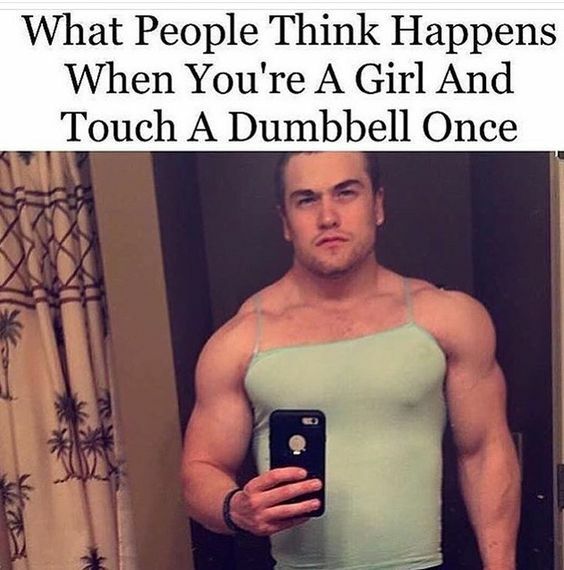 This can make some women nervous about venturing forth into the weights section of the gym. But ask anyone who is seeking “gainz” (adding muscle mass) and they will tell you: it is HARD. It takes *SO* much to get to that level: a LOT of time at the gym (and just a lot of time in general); a LOT of weight on the bar; and a whole LOT of protein. And without constant vigilance of diet to attain low body fat percentages, those muscles aren’t going to show through anyway. It’s even harder for women to build huge muscles due to lack of testosterone. The women you see in bikini bodybuilding competitions are often on steroids. If you DO want to look very muscular, THERE IS NOTHING WRONG WITH THAT! Just be prepared to put in a lot of hard work. For the rest of you, I challenge you to lift heavy. You might be surprised just how much weight you can lift before you notice any visible muscle growth. The muscles you build will help you burn calories while you sleep, and you can always stop increasing the weight if you feel your physique is getting too “bulky” for your tastes. Feel like a total badass! What’s your #1 reason for hitting the weights?